For years exploited stone pits have had negative impact on the environment. Previously, more than 60% of the total volume of construction stone products of the Republic was produced in Artik and its adjacent communities. Many mines were closed due to reduction of construction stone consumption volumes, conservation and reclamation works of the mines have not been carried out thus causing many environmental problems. Hundreds of hectares of agricultural and natural landscapes were degraded and lost natural way of restoration due to such exploitation of mines. Dust through strong winds and solid remnants through snowmelt and rainfall spread over great distances polluting natural agro landscapes. 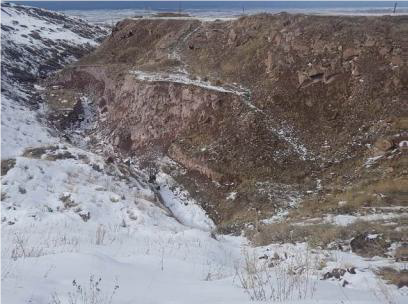 The project seeks to improve resilience of highly exposed Artik city of Armenia to hydro-meteorological threats that are increasing in frequency and intensity as a result of climate change. The project will reduce the quantity of debris flowing to reservoir located down the Artik city and the pollution of agricultural lands (300 hectares of arable land 190 hectares of pastures, 15 hectares of hay meadows, 640 ha of artificial forests, 80ha of water reservoir and other natural landscapes) in the project impact area by increasing their resilience and adaptation to climate change. To improve and to promote self-recovery of more than 300 hectares of arable land 190 hectares of pastures, 15 hectares of hay meadows, 640 ha of artificial forests, 80ha of water reservoir and other natural landscapes. To reduce hazards caused by floods and to contribute to adaptation of natural and agricultural landscapes and ecosystems in the impact zone of floods.